WASHINGTON, Feb. 14, 2000 -- In cooperation with the U.S. Consumer Product Safety Commission (CPSC), New Cole Sewell Corp., of St. Paul, Minn., is recalling about 23,000 storm doors manufactured without retaining pins in the upper windows. The upper window can fall out and could injure those standing nearby. New Cole Sewell Corp. has received 15 reports of upper windows falling out of the storm doors. No injuries have been reported. The manufacturing date and product number are encoded in the 15- digit registration number. The first six digits are the manufacturing date, written as month, day, and year. The next five digits are the product number. The registration number is located on the interior side of the door, just below the lower left corner of the bottom window. "COLE SEWELL" also is on the registration number label. The company will help consumers identify if their door is part of the recall. The doors are either white or bronze with a black, push button handle. Home Depot, Hechinger, HomeQuarter, small lumberyard and do-it- yourself centers sold these storm doors from June 1999 through December 1999 for between $80 and $140. Consumers should remove the storm door's upper window immediately and call New Cole Sewell Corp. at (800) 328-6596 between 7 a.m. and 6 p.m. CT Monday through Friday to receive a free window with installation instructions. Consumers also can write to New Cole Sewell Corp. at 2288 University Ave., St. Paul, MN 55114. WASHINGTON, -- In cooperation with the U.S. Consumer Product Safety Commission (CPSC), Prometheus International Inc. is recalling about 4,000 novelty lighters. The lighters do not have any child-resistant mechanisms, as required by the Consumer Product Safety Act. Young children could ignite the lighters, presenting a fire hazard. Shopping (SOS). Operation SOS, launched in December 1999, is a CPSC initiative that monitors web sites for recalled, illegal and potentially hazardous consumer products being sold in cyberspace. CPSC and Prometheus International Inc. are not aware of any incidents or injuries involving these lighters. This recall is being conducted to prevent the possibility of injuries. The Intruder model lighter looks like a miniature propane or scuba tank, with a rectangular sleeve on the side into which the bottom part of the black activation/ignition button fits. The top two-thirds of the cylindrical tank body and the sleeve are black, and the tank is clear and transparent. A label on one side of the sleeve reads "Prometheus." A cover hides the flame port. The Jupiter model lighter has a metal body with a black top and bottom. The lighter has a distinctive gun-like shape. It has a hinged cover for the flame port. 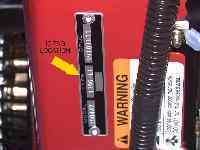 The cover opens when the ignition switch is pressed or the hinged cover is pulled back, and a high-intensity torch flame is produced. On the end opposite the flame port, a black screw-on cover hides the refill port. The brand name "Prometheus" is engraved into the lower area of one side of the lighter body. Tobacco stores nationwide sold these lighters from March 1997 through February 1999 from $50 to $75. The company advertised these lighters on their web site at www.prometheuskkp.com. Consumers should stop using these lighters immediately and return them to the store where purchased for a free replacement lighter with a child-resistant mechanism. For more information, call Prometheus at (800) 229-5233 between 9 a.m. and 5 p.m. PT Monday through Friday. WASHINGTON, Feb. 3, 2000 -- Briggs & Stratton Corp. is voluntarily recalling about 2,600 Vanguard V-twin gasoline engines with 9-quart fuel tanks. The engines were used in various brands of construction, industrial and lawn and garden equipment, including vacuum lawn sweepers, air compressors, leaf blowers and pressure washers. The fuel filters on these engines can leak gasoline, posing a fire hazard. Briggs & Stratton has received six reports of engine fires, one resulting in a minor burn injury. "VANGUARD V-Twin" is written on the engines, which are red or black. There are identification tags on the side of these engines with model number 294442, 294447, 303442, 303447, 350442 or 350447. 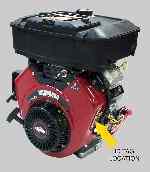 Only engines with 9-quart fuel tanks manufactured by Briggs & Stratton are part of this recall. These tags also show an 8-digit code with the first six digits indicating the date the engine was manufactured by year, month and day. For example, 990215XX would indicate the engine was manufactured on February 15, 1999. The recalled engines were manufactured between February 15, 1999, and November 17, 1999. The engines were sold separately and to equipment manufacturers. Equipment containing these engines were sold nationwide from March 1999 through November 1999. The engines alone sold for about $1,200. In addition, about 4,600 clear, plastic fuel filters were sold separately as replacement parts for Vanguard engines with 9-quart fuel tanks. They have replacement part number 808116, which is written on the bottom of the filter. They were sold for use on these Vanguard V-twin engines manufactured on or after August 23, 1995, including all the model numbers of recalled engines listed above, and engines with model number 290442 or 290447. Briggs and Stratton distributors and dealers sold these fuel filters from March 1999 through November 1999 for about $5. Consumers should stop using these recalled Vanguard engines and fuel filters even if no leaks are detected. Briggs & Stratton will install a new fuel filter on the recalled engines free of charge, or provide a free replacement spare fuel filter. For more information, contact your local Briggs & Stratton dealer or call (800) 999-9444 between 9 a.m. to 5 p.m. CT Monday through Friday.